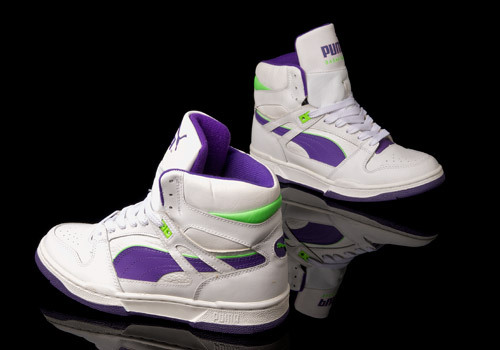 The 90s certainly brought on a loud period with the music and the mainstream culture of rockin’ high tops off the court. From what we understand kids would match up their tracksuits to their shoes and come to the court unlaced and loose before tightening their eyestays and gettin’ into the dribble of the game. 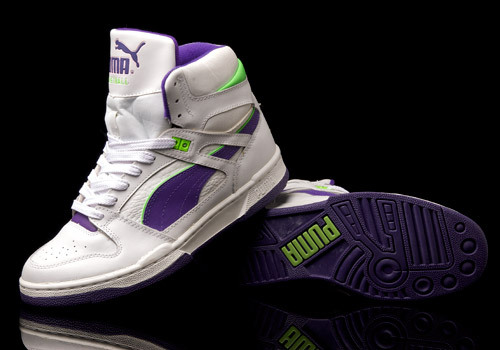 And thus, this era gave birth to many classic high tops as well as lesser known silhouettes such as this PUMA Invader Hi. 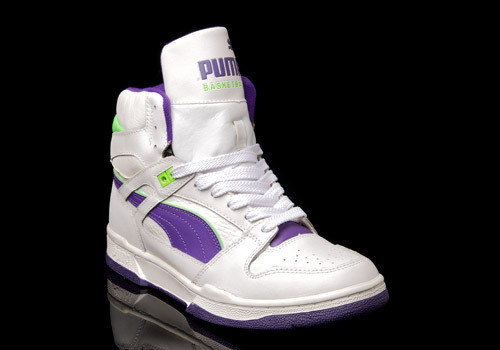 Neon green and standard bright grape purple, these Invader Hi’s are quite similar to the PUMA Raider model. 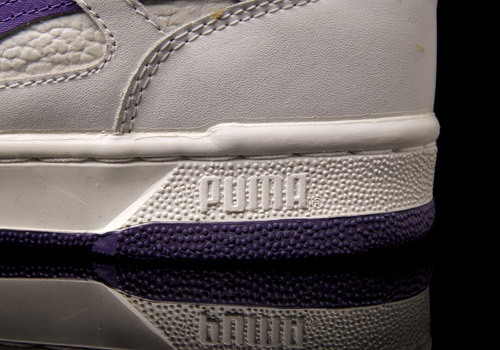 On both, the lower eyestay is attached to the toe box by an extra layer of leather, and is separated from the rest of the eyelets. Further, both breakup the eyelets again near the top of the upper, using a second leather layer reinforced with plastic eyestays. 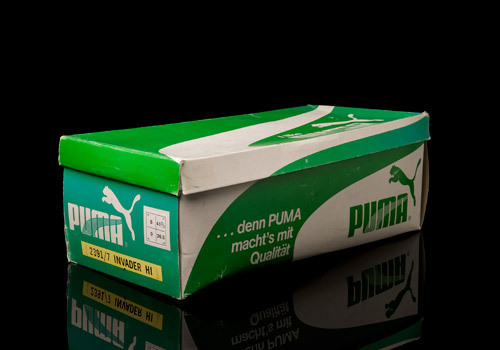 As well, both shoes cup the heel with a sturdy base and then layered leathers for support and padding, combined with a fuzzy, thick, inner lining that’s definitely supportive. Tongue designs are quite similar too, except that the Invader is much smoother without the animal texture, which is instead applied to the leather layer underaneath the dual color form stripes. 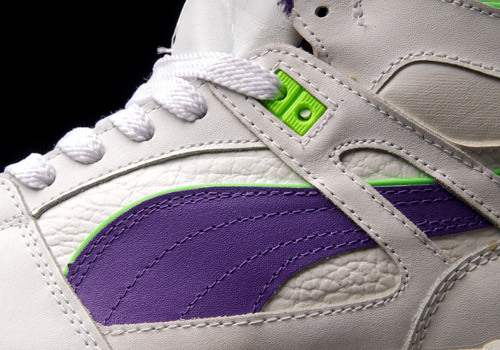 Lastly their outsoles are quite simlar too, showing off a simplistic yet interesting, geometric design. 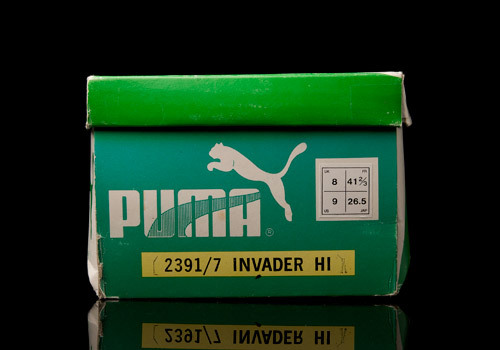 These PUMA Invader Hi’s are mad comfortable, totally durable (considering the condition of this pair from the 90′s), and certainly a crispy lookin’ kick even by modern day standards.